Juggalos and Juggalettes…we’ve been seeing dates pop up for random Insane Clown Posse shows over the past week or so, and that obviously got us hype about a possible October tour! Well, I’m happy to announce that the Wicked Clowns ARE in fact going on a tour spanning almost the entire month of October! The tour is called the Hallowicked Traveling Freak Show Tour Silver Jubilee, and it’s celebrating 25 Years of Hallowicked! Dates span from October 5th – October 29th so far, but don’t think they are gonna leave Detroit out of the mix for Halloween night! Check out the official post with dates and ticket links below! 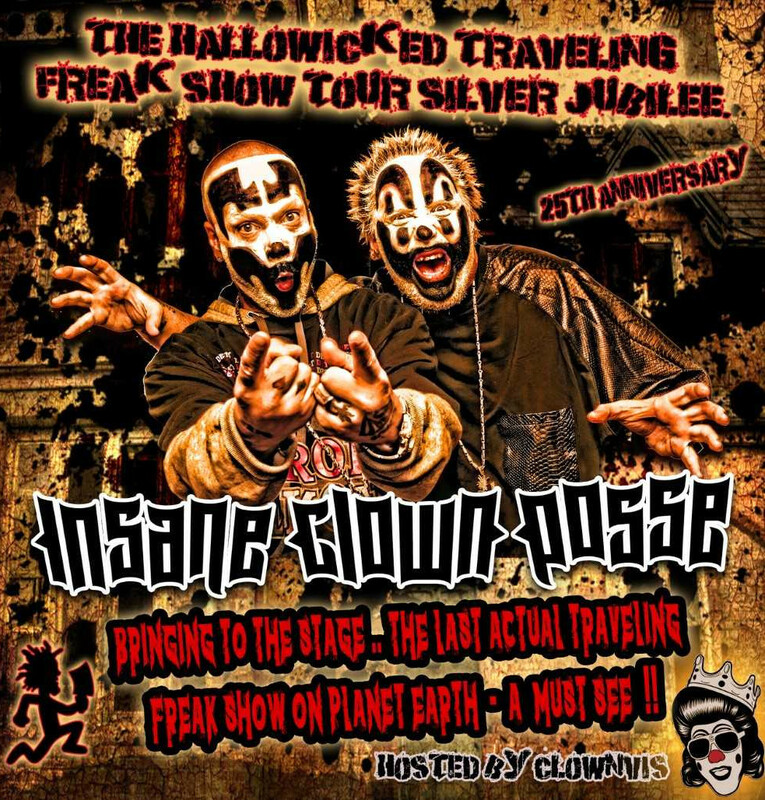 Insane Clown Posse present…The Hallowicked Traveling Freak Show Tour Silver Jubilee!! Prepare your eyes to be Amazed, Disgusted, and Astonished as you witness…. Live on stage…. The Last Actual Traveling Freak Show on Planet Earth!!! Tickets are on sale now and going FAST!!! Juggalos, I’ll see you in Dallas AND Detroit! Whoop Whoop! Guess the people running the Masquerade here in GA don’t want their new venue location to be tainted with Faygo all over the place. Where is the actual Hallowickid show on 10/31?!?!?! ^Typically they hold it in either Detroit or Anchorage, Alaska. It was in Michigan last year so look for it to be a little closer to Russia this go around. I like how Scottie D didnt redo the links to the ticket sellers and it still asks if its ok to leave Facebook. You’re right MasterWeedo, it’s been fixed. Wonder what Hallowicked single we get this year! I heard it’s called “Sleepy Hollow” and features Vanilla Ice lol, no I imagine with SV being promoted at the past GOTJ, and next year being dubbed “The Soopa Gathering” I could see the Hallowicked single being from Soopa Villainz. Maybe be a follow-up to “Silence Of The Hams” (like a part 2), or just a song unrelated to the first. Need another So-Cal date the 23rd and 24th just don’t work for me!!!??? ?